The boid snakes include boas and pythons, the former found mostly in the New World and the latter in the Old. The Boa Constrictor is the boid snake most commonly seen in captivity and perhaps best known. Tens of thousands of young specimens collected in South America have been imported into the United States as pets. Fewer than one out of a thousand ultimately grows large enough to become a problem to the owner and is then donated to the local zoo. Most boas reared in captivity remain stunted and do not reach the 18- to 19-foot maximum length of wild adults. 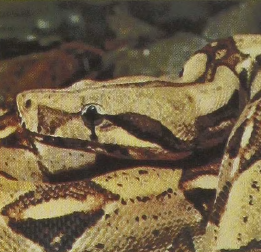 The Boa Constrictor feeds mostly on birds, its long teeth permitting it to penetrate the thick coat of feathers. As the name implies, this beautiful snake of the tropical American forests kills its prey by constriction. 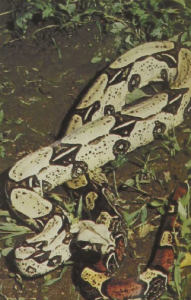 Like other constrictors it responds to the minor vibrations produced by the pulsing heart and keeps the coils around its prey until the beat stops. The pressure applied does not break any bones and the food object is swallowed in its entirety. The Boa Constrictor gives birth to live young.